Representatives from the city of San Diego held a press conference this morning to announce their commitment to improving fifteen intersections identified by CirculateSD, a local bicycle and pedestrian advocacy group, as needing urgent attention. The so-called Fatal Fifteen have the highest rates of bike and pedestrian injuries and fatalities in the city. The city says it will improve all fifteen of these intersections in the next budget cycle, adding high-visibility crosswalks and pedestrian countdown signals with audible crossing prompts. “Fixing the Fatal Fifteen is a major step towards ending senseless traffic fatalities in San Diego,” said Councilmember Chris Ward at the press conference. This is the first action taken towards implementing the city’s Vision Zero policy, which it formally adopted in 2015. A true Vision Zero policy would aim all funding, policy, and design decisions towards the end of eliminating traffic fatalities from the city. So far San Diego has worked on strategic plans, training, education, and seeking grant funds to support its policy. Adopting Vision Zero goals is a big cultural shift for car-oriented San Diego. But, Rosas pointed out, providing safe places to walk and ride bikes also ties into the city’s Climate Plan, which aims to raise the mode share of transit, walking, and biking. That shift to less environmentally damaging modes will most likely be seen first in higher-density areas. The Fatal Fifteen are intersections in highly populated, older mixed-use neighborhoods with commercial corridors near housing. “These are places where people are already walking and biking,” said Rosas. “It may seem obvious that this is where there are more injuries and fatalities,” because there are more people on the streets there, but it is also where simple safety upgrades are likely to bring the most improvements. 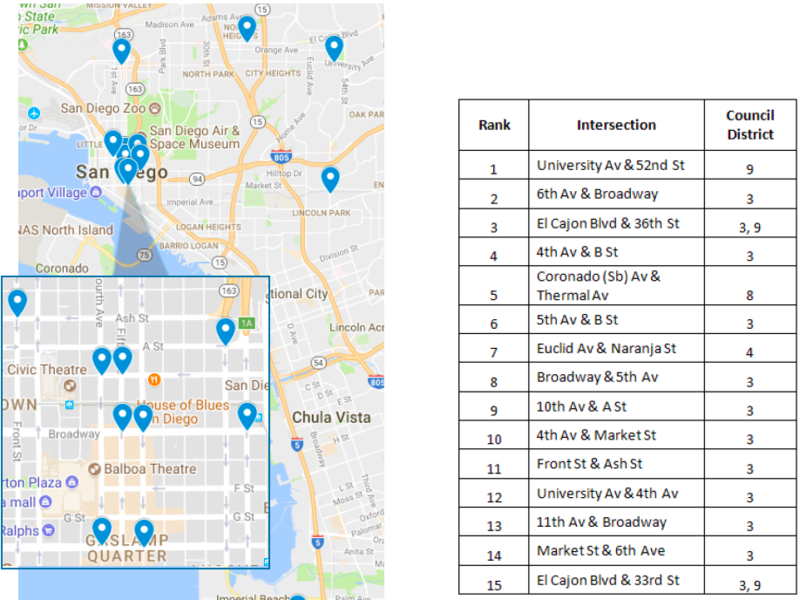 CirculateSD has analyzed collision data for the city, identifying eight “Vision Zero corridors” that have the highest number of collisions along their entire length. The city has commissioned its own crash analysis report, which will be an in-depth statistical study of collisions, but that won’t be finished until June. “We can’t wait,” said Rosas. CirculateSD “did a lot of the front-end work, using data to show where we think the need is greatest, and where projects can have the greatest impacts,” so that the city can get moving in its current budget process, which is up for discussion this week. CirculateSD will continue working collaboratively with San Diego and supporting a data-driven approach to safety. “The city absolutely needs to do more to reach Vision Zero,” said Rosas, and CirculateSD will help make sure they’re taking steps in the right direction. If that’s all that’s being done, that’s not nearly enough. That would just spend a lot of money and not have much impact. Auto speeds need to be reduced by design, the number and width of lanes to be crossed needs to be reduced, and signal cycle times need to be reduced so people walking aren’t forced to wait an excessive amount of time to cross a street just so the street can function as a mini freeway with long cycle times.